Folks, I work a lot with epoxy and reply on it as a structural adhesive to both fill gaps and bond parts together. I’ve done everything from fixing car parts, wood furniture, tools, rifle bedding, scope mount bedding, custom knife handles and much more with epoxy. It is incredibly versatile but you need to do some planning to really get what you want out of it predictably. What I have found over the years is that not all epoxies are created equal so spend the money and buy quality epoxy. There can be a huge difference in how well the epoxy will last over time and/or how strong it really is. Do not buy the bargain basement junk. In general, if the maker lists all the physical properties then it is a well thought out and executed formula. 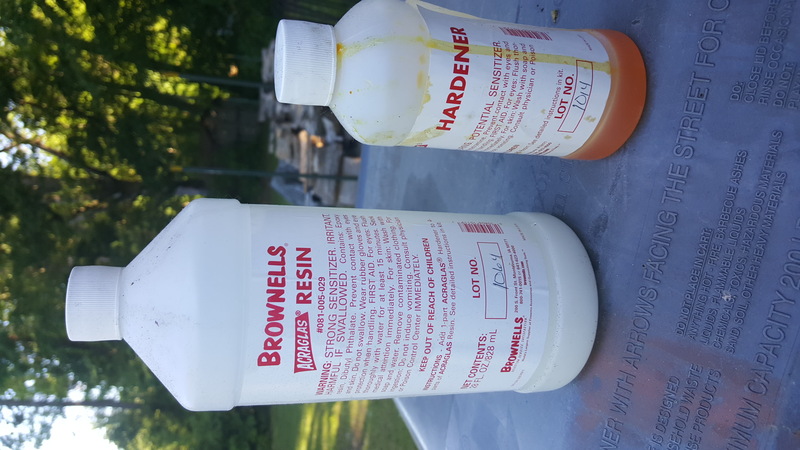 I have three epoxies that I use the most in order are Brownell’s AcraGlas liquid (not the gel), Locite E-120HP, JB KwikWeld and ITW Devcon Plastic Steel. Once in a while if I need a fast cure epoxy, I will get a retail blister pack of some five minute epoxy and I’ll explain more in a moment. Liquid, Gel/Paste or Putty/Bar — The liquid can seep into pores and fibers plus it can be spread but it can run into places you do not want. Gels and pastes tend to stay put better but do not seep in as well. The really thick puttys and bars are great for filling space or creating an impromptu clamp or to seal a hole but they definite don’t sink in much. 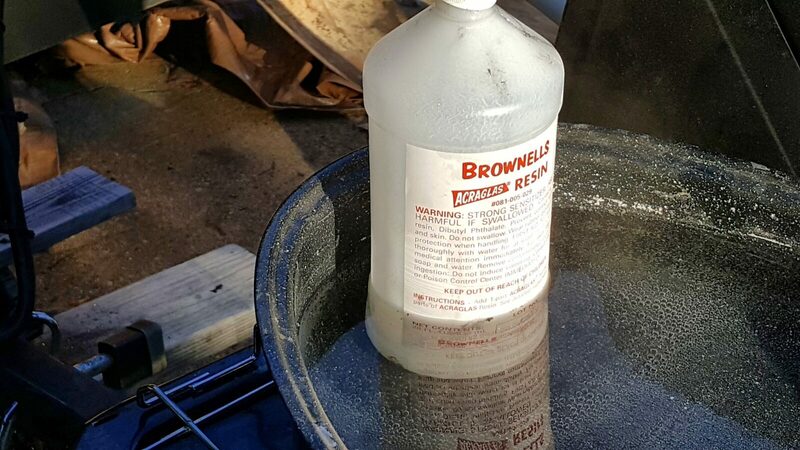 Temperature – you need to think both about the temperature when you are mixing and applying the epoxy as some will not set up at all if too cold. You also need to think about the heat when in operation because many epoxies soften and lose their bond the hotter they get. 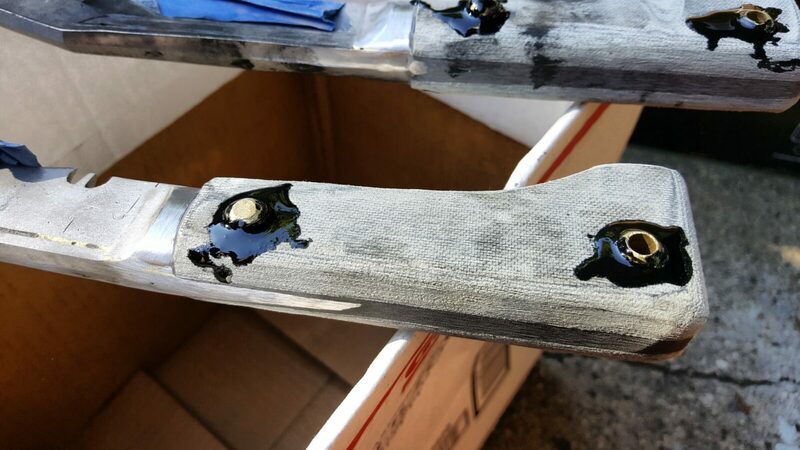 For example, you may apply epoxy to an exhaust manifold but it will blow off when it gets hot. Pot life – this is how long you can still apply it before it starts to thicken. Some folks will refer to this as working time. You need to mix the two parts together, apply the epoxy, position and clamp the work before you run out of time. Keep this in mind. Shock resistance – some formulations hold up better than others before they start the break apart and “sugar”. Sugaring refers to the powdery look epoxy gets as it breaks apart. Brownell’s AcraGlas, Loctite E-120HP, JB KwikWeld and ITW Devcon Plastic Steel have all held up very well for me under shocks. My go-to epoxy for most work is Acra-Glas liquid because it holds up so very well. What many people do not know is that the faster an epoxy cures, the weaker it is. Conversely, the longer the formulation takes to cure, the stronger it is. All things being equal, a 24 hour curing epoxy will be stronger than 90-second, 5-minute, 30-minute and so forth epoxies. Now there is a time and a place where speed is needed and also situations where strength is paramount. 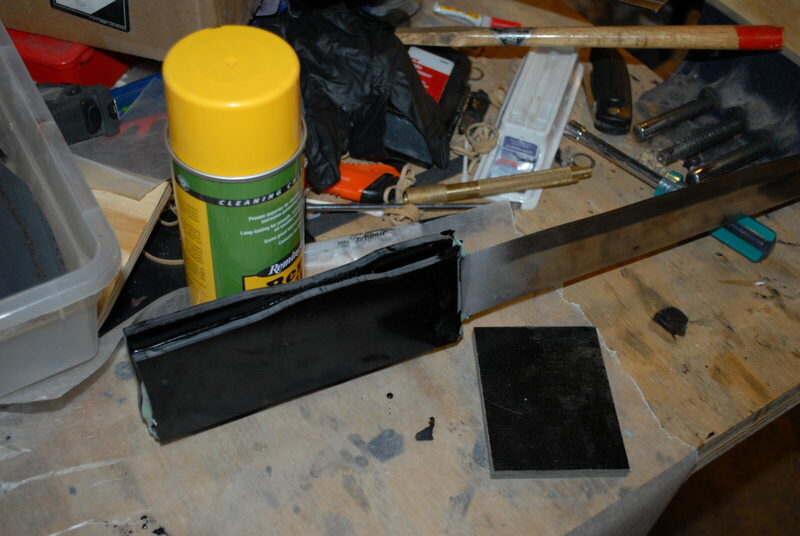 When I make khukuri hands and other things where strength is critical, I always use a 24 hour epoxy. Be sure to carefully follow the mixing ratios. For volume ratio work, I use 10cc or larger syringes without the needles on them to meter liquid resin and hardener. For example, I like AcraGlas and it is 4 parts resin to 1 part hardener. I keep two syringes separated that I re-use over and over. With the syringe in the holding cup labeled “resin”, I use it to draw 4 cubic centimeters (CCs) of resin out and squirt it into a mixing cup. With the hardener syringe, I meter out 1 CC of hardener into the cup. Now you can vary that. 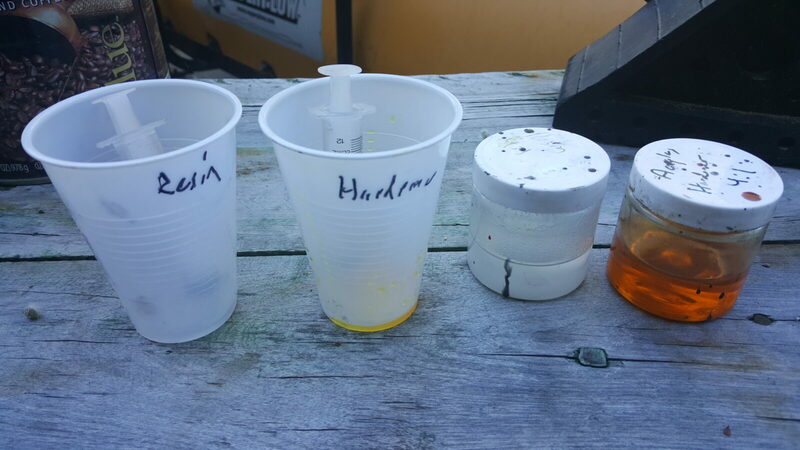 If you need a smaller about, meter out 2 CC of resin and 1/2CC of hardener. The syringes really help. If you are doing larger volumes then either use bigger syringes or disposable cups that have measurements printed on the side. Also note how I pour from the bulk container into the smaller intermediary containers that are easy to work with plus I avoid contamination, dropping a big bottle, etc. The Loctite E-120HP comes in a specialized dispenser tube that uses a gun and tip to do all the mixing. It’s cool as can be for volume work where additional coloring or fillers are not needed. For the Devcon Plastic Steel, I use my digital scale. Here’s one thing not to do: Some guys have heard that if they add more hardener it will cure faster. This may be true but the resulting cured epoxy will be weaker. Do not deviate from the manufacturer’s recommendations if you want the physical properties they report. Folks, I can’t stress this enough. Mix the heck out of the two parts and combine them thoroughly. If you are doing larger volumes, consider doing what is known as a double pour. Pour the two parts into a first container, mix them thoroughly and then pour the combination into the middle of a second container and mix. What a double pour does is avoid having unmixed materials that have stuck to the walls of the container come out when you are applying the epoxy. Keep your pot life / working time in mind. Most of the time I am using a generic 5oz plastic cup and plastic knife to do the mixing. I buy them by the hundreds for Ronin’s Grips and they are cheap regardless. Do not use styrofoam. Whatever you want to bond epoxy to had better be clean and free of oils, greases, waxes, release agents and so forth. Second, the more abraded the surface the better. If you abrasive blast a surface not only can you double the surface area being bonded together but the irregular surface creates many opportunities for the epoxy to get “under” material to create a better grip. If you can’t blast then at least sand the surface with 80-100 grit sand paper. Shiny is bad. A polished smooth surface will not give you anywhere near the bonding strength that a blasted or abraded surface will. 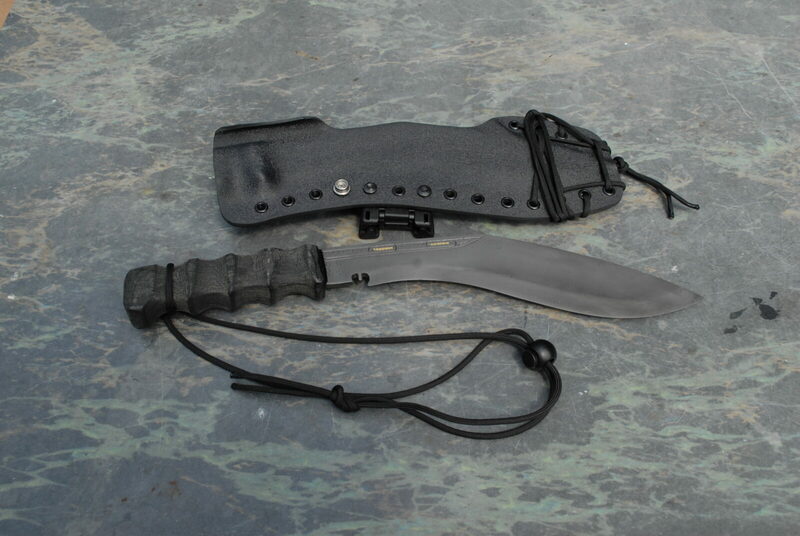 I blast everything that I can – metals, micarta, plastic and even wood. It makes a world of difference – seriously. Heat can help you two ways. First, by warming epoxy it tends to flow better. 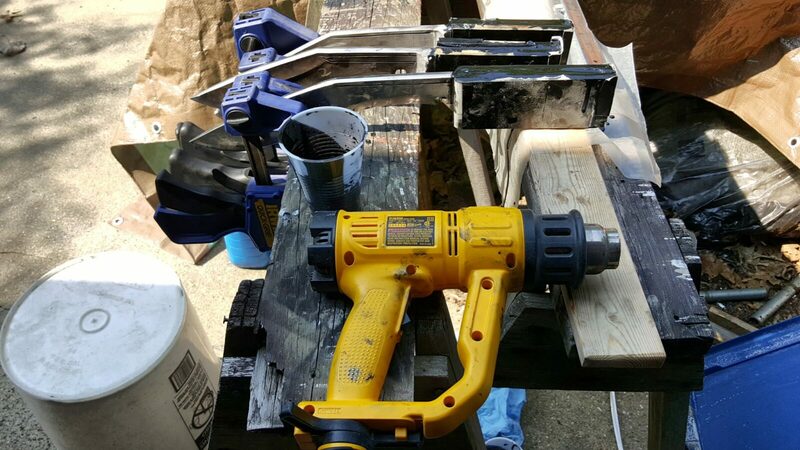 If you need to to soak into wood or other surfaces, consider using a heat gun to blow/chase the epoxy into the wood. Do not burn the epoxy – just warm it up. Second, in general, warming epoxy up tends to make it cure faster. Now there are limits and you need to either experiment or talk to the vendor before doing anything too radical. I will often use a halogen light or other heat source to warm the surface up to 80-100F. In chemistry, there is a formula known as the Arrhenius Equation that notes that for each additional 10 degrees Celsius added, a reaction rate doubles (click here for more info on the equation). My experience is that you want the heat to penetrate and warm all of the epoxy and not just the surface and you also do not want to burn the epoxy. In general, I do not exceed 100F but that is just me. I found something that works good enough and have just stayed there. Also pay attention to the minimum temperature requirements for curing. Some epoxies will not do anything at all at freezing. Some take forever to cure at 50F. It just depends. When in doubt, use a lamp or something to gently heat the part. What many folks do not know is that you can actually color epoxy. I have found two approaches that work. First, use powdered tempera paint. You can stir in a bit of black powder to get black epoxy. Now I did this starting out and have since moved to using epoxy dyes so I am added less powder to the mix because I want to save the volume for glass fillers which we will talk about next. You can modify the physical strength of epoxy by adding a substrate or fillers. For example, fiberglass is matted glass fiber that bonded together with epoxy made for that purpose. Folks working with carbon fibers are using epoxy for bonding that together. 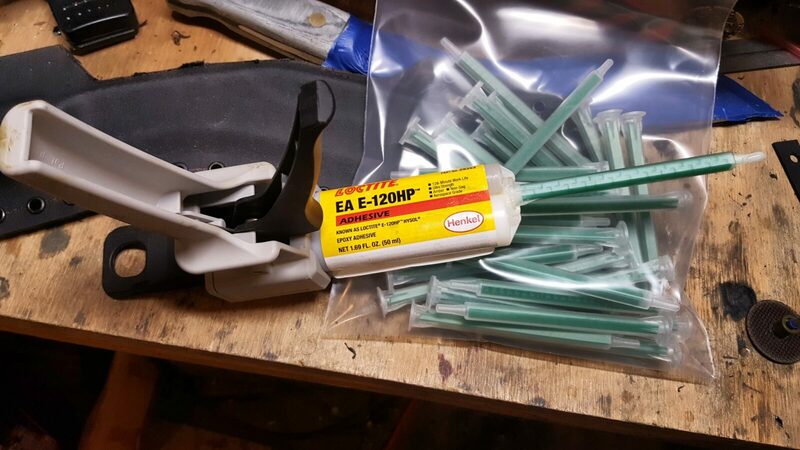 I add 1/32″ milled glass fibers to my epoxies to get more strength. If I want more of a paste, I add more glass fiber and if I want it to be more of a liquid, I use less. The exact volume of glass fiber depends on what you are trying to do. Some vendors will give you recommendations and others will not. 1. Be careful that you secure the material and that it can’t shift while curing. I can’t tell you how many times I have checked stuff and found out it moved and had to change my approach. Figure this out before you apply the glue in case you need to make something, change your approach, etc. Check it regularly to make sure it hasn’t shifted regardless. Every time I think something can’t move – it does. 2. The epoxy will run out of what you are working on. Decide how you are going to deal with it. 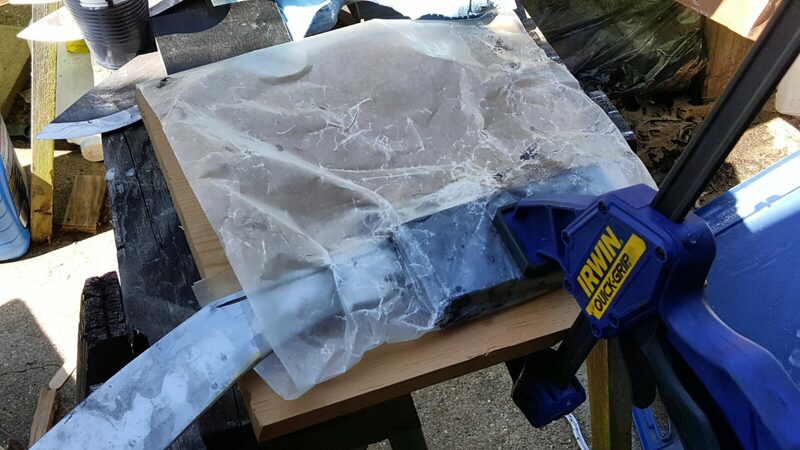 Wax paper can protect your tools and table. You can scrape the epoxy off after it has partially cured. You can wipe things down with acetone when partially cured. Just think it through otherwise you are going to glue stuff together really well that you do not want bonded – trust me. It is a real headache so plan for seepage/dripping and how you will deal with it. This is something I have gotten better at over the years – wait the recommended amount of time. If they say 24 hours then wait 24 hours. If you have questions about using the part sooner then ask the manufacturer. For example, you might be able to assemble something after 10 hours but not actually put it under strain for 24 hours. Factor in the temperature. The colder it is then the longer it will take. Remember what I said about the heat from lamps above. Yeah, I had to add this. Follow all guidance from the vendors. The resins aren’t too bad but some of the hardeners are nasty. Wear rubber gloves, use eye protection, work in a well ventilated area and wear a real good dust mask when sanding. I use N99 masks now for everything. I hope you found this general epoxy guidance helpful! 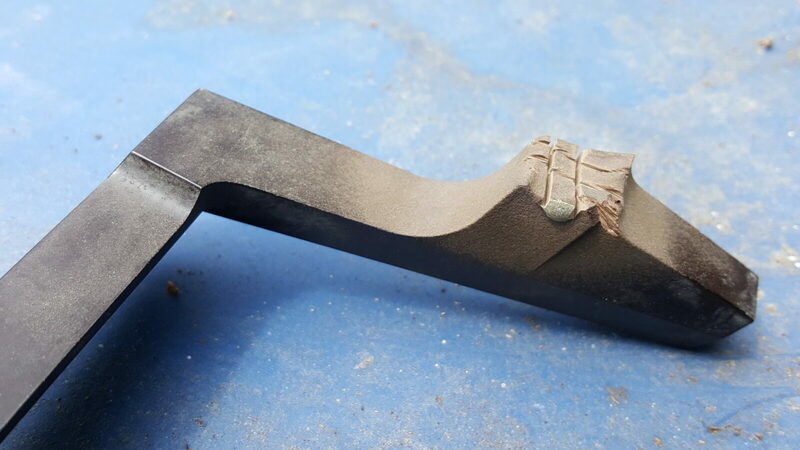 JB Weld – note that this is a thicker grey liquid. I use it if I am in a rush and need an epoxy. I’ve used it to bed rifles and repair stuff mainly. I have not used it on knife handles. Also, due to its grey color, you can go darker towards black but not lighter. JB Weld 50240 ClearWeld Professional Grade Epoxy, Clear 8 oz. Epoxy Dyes – there are a bunch on Amazon but I don’t know them. In general, I use So-Strong dyes from SmoothOn when I need small amounts. My black dye is bought by the pound in bulk containers. Digital Scale – it will get filthy so buy something cheap but with good reviews. 11 lbs 5KG Glass Top Digital Scale Food Scale Grams Ounces Pounds 7 x 5.5 In. Salter 3001 5-Pound Elite Digital Kitchen Scale Black/Chrome - USED - WORKS! 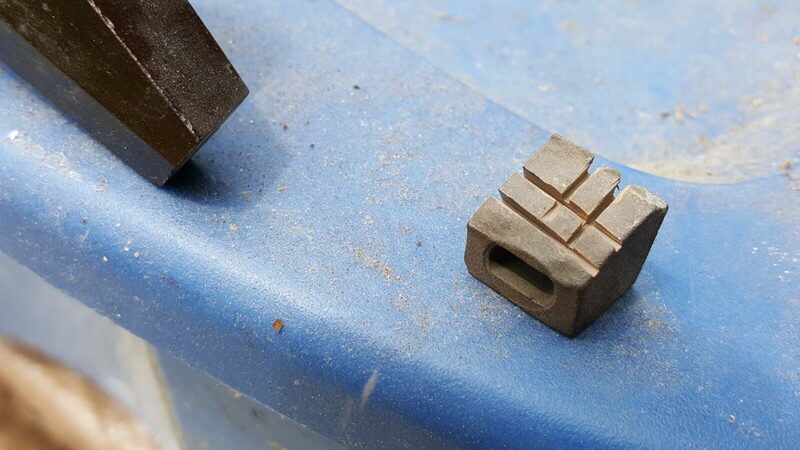 Clamps – there are so many ways to clamp stuff together. 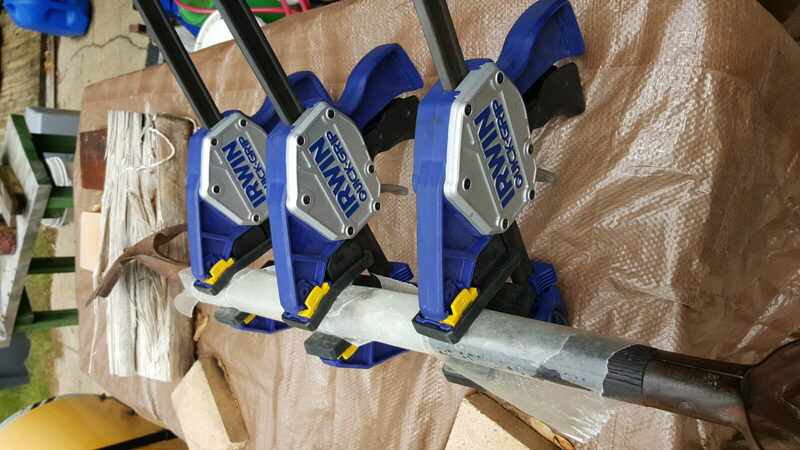 I use everything from woodworking vises to spring clips to C-clamps to the big heavy duty Irwin clamps that can do up to 600 pounds of pressure with one hand. Wax paper – any kind will work. I buy mine at the grocery store. Plastic Cups – I’d recommend checking around. You need to balance cost and quality. Some cups are absurdly thin and you can’t use them for mixing. I get mine from GFS and you can tell they have made them cheaper and cheaper over the years. 5oz is still good but 9 and 16oz cups aren’t so red hot any longer. 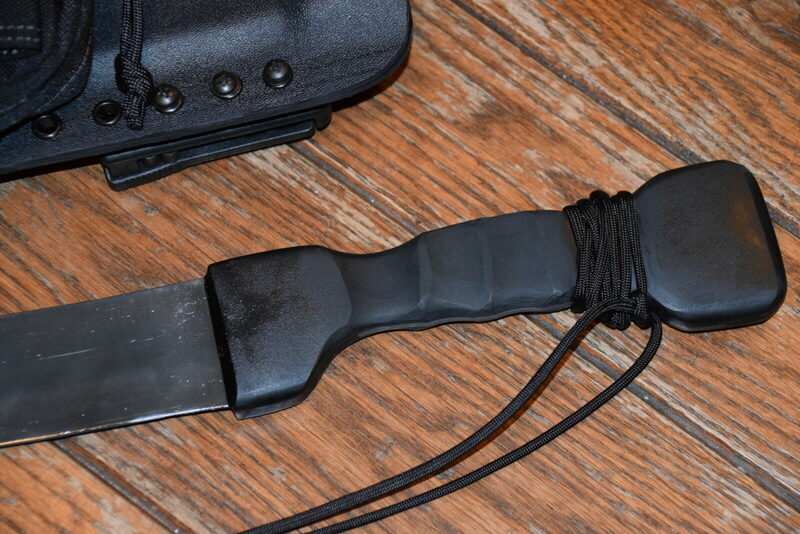 Plastic Knives – again, check around. I get mine from GFS in a big box and they work just fine. Heat gun – I have burned out a ton of them. This DeWalt D26950 is the first one to last longer than a year. I’d guess I’ve been using it for almost three now. Dust Mask – I used Moldex 2310 N99 face masks now exclusively. They hold up fairly well and aren’t hard to breath with. Nitrile Gloves – the best deal I have found is from Harbor Freight for their 5mil gloves. When they go on sale or you get a coupon for $5.99/box of 100 gloves, go get them. They are thin and don’t hold up to tough use but to keep your hands clean and balancing off strength and cost, they are a pretty good deal. Even at $7.99/box without shipping they are a pretty good deal.